We make ordering and re-ordering easy! Type in the item numbers and quantities desired. You can add as many items as you need - just click "Show More Item Boxes" to add more products. You may also enter an Item Number's UPC Code. When your list is complete, click on the "Add to Cart" button. Enter the "Product ID" or "UPC Code" in Column A and the "Quantity" in Column B as Shown Below. 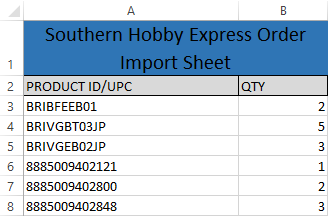 Click "Choose File" on the right to select your Express Order Spreadsheet then click "IMPORT"